I haven’t posted recently because it’s busy, busy time for birding. I’m participating in a new project, the Rhode Island Bird Atlas 2.0. A little more than 30 years ago Rhode Island conducted a breeding bird atlas. This consisted in surveying the state over several years to determine which species of birds were actually breeding in the state. It’s now time to update that data, only now wintering birds will be included as well. This current effort is a five year project. It works like this. The state is divided into 165 blocks, each 10 square miles. For each block there is a volunteer coordinator and, in many cases, volunteer contributors. I have assumed responsibility as the coordinator for seven blocks, a task made possible only because I am now retired and have a couple of very able contributors to assist me. I will be posting photos from our ventures from time to time. First, a disclaimer. These photos are catch-as-catch-can. They are here because of their informational content, not necessarily their photographic quality. I’m using a Nikon D7100 camera body, which has a sensor that’s 24x16mm, approximately 2/3 the size of 35mm film. This is commonly called a crop sensor, but it has the advantage of yielding 1.5x the focal length of the lens used on it. I am using a Nikon 300mm f/4 PE lens. With the crop effect, this is equivalent to having a 450mm lens. Photos are taken hand-held, and of whatever view the bird may present. Sometimes they will have branches or other interference impacting the image. Occasionally they’ll be slightly out of focus. I’m posting them for their informational content, and will provide some detail about the species or specifics of the situation involved. Here are a few photos from April. We were birding in Lonsdale Marsh, in Lincoln, RI this day. 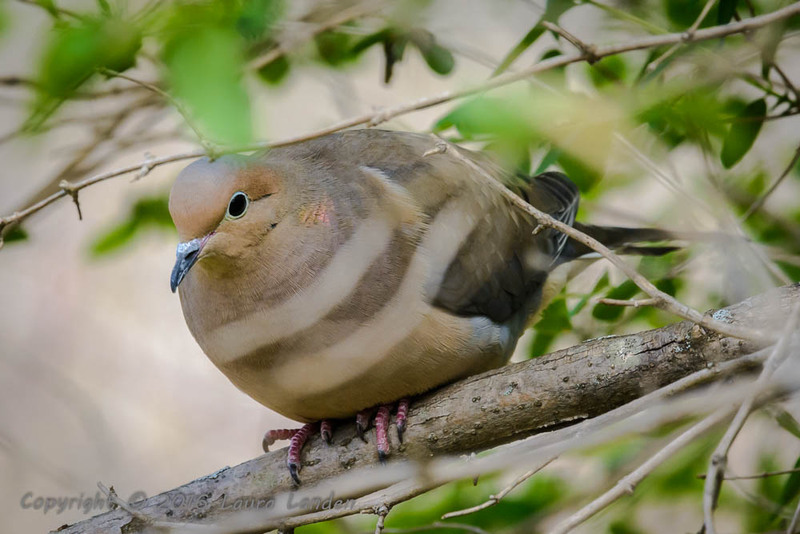 This Mourning Dove was in a low shrub. We suspected there was a nest nearby. 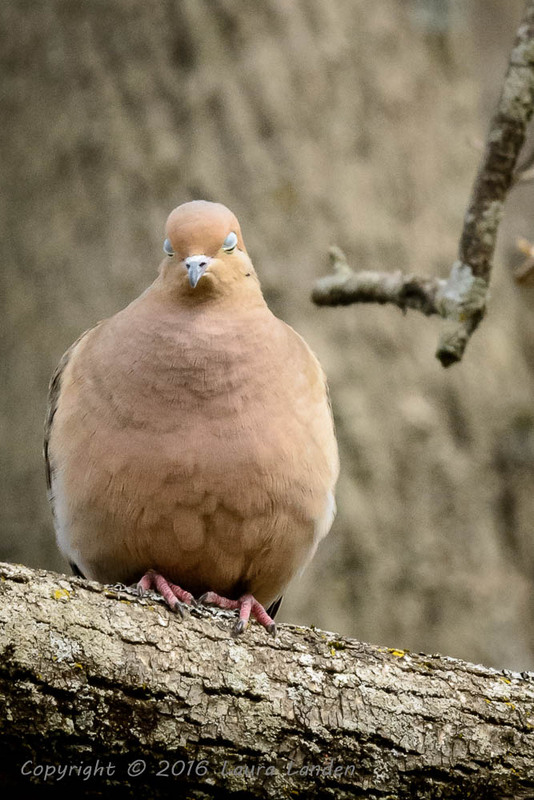 This Mourning Dove was on a branch. I happened to capture the image just as the bird blinked. 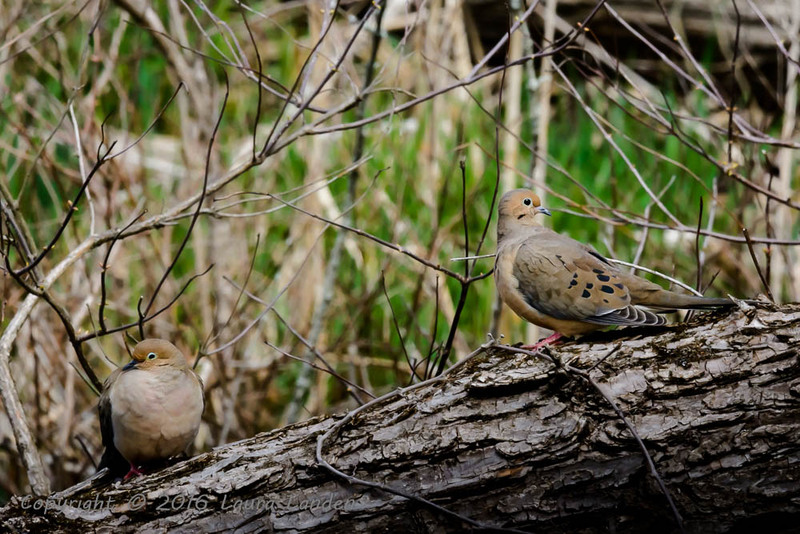 Here’s a pair of Mourning Doves. 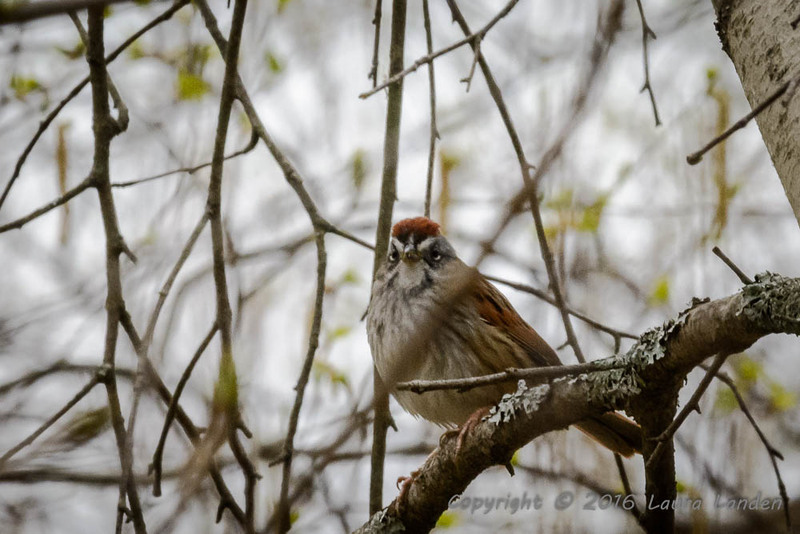 These final two images are of a Swamp Sparrow. We puzzled over the identification because all the field guides we consulted showed a different pattern on the side of the head. 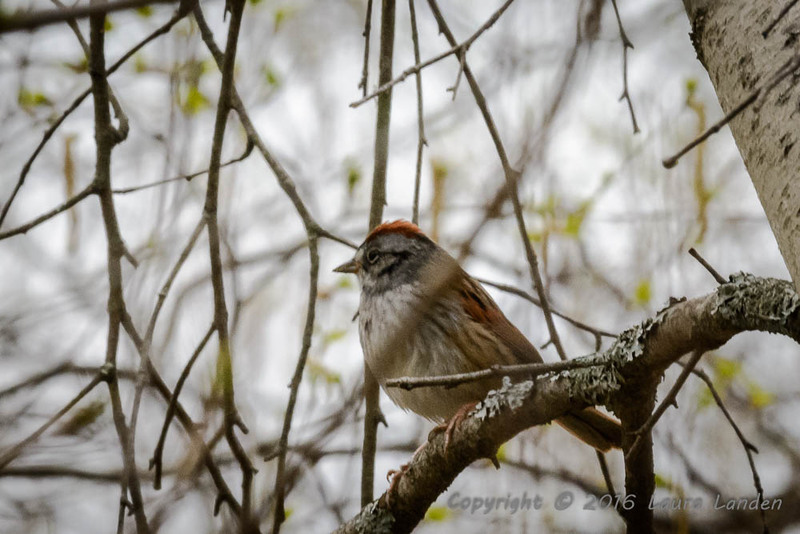 But, a Swamp Sparrow it is. Often there is some variability from bird to bird. Some birders prefer guides with photographs. The advantage of photos is that the guide presents actual birds, as observed in the field. The limitation, however, is that the photos only show a point in time for a specific bird. Other birders prefer guides with illustrations. The advantage of this approach is that the artist can generalize from study of several specimens. The limitation is that no actual bird may look exactly like the representation. It’s a matter of taste, although most birders have at least one guide of each sort. Nice, Laura. Thanks for sharing these, and for the discussion of bird guides. I don’t think I would purchase one without pictures.